From the “Picture Book of Courtesans”(Keisei ehon) In a new type of clearly structured iconographic composition, this print shows the beautiful Komurasaki. Her personal crest was a quatrefoil flower in the pattern of a tortoise shell. In keeping with her name, “little Murasaki” the motifs on her kimono allude to Murasaki Shikibu, the author of the Genji-monogatari. Komurasaki was a famous figure in the world of ukiyo-e.
TORII Kiyonobu I (ca. 1664-1729): Kiyonobu was born into a family of artists; his father was Torii Kiyotomo, who was an artist and painter of theatre posters in Osaka. In 1687 the family moved to Edo, and it was here that Kiyonobu set out on his successful career as a painter of book illustrations, following in the footsteps of Moronobu. Towards the turn of the century, Kiyonobu, together with Kiyomasu I, created a new style, which makes it rather difficult to distinguish between the two artists. However, this new style was of fundamental importance to the woodblock art of their time and the following years. Perhaps Kiyonobu’s compositions are somewhat more generous and expansive than Kiyomasu’s, while the latter’s works are more flexible and graceful. The information handed down about the relationships between the most important artists of the early Torii School has always been confused and it will never be possible to clarify it absolutely. In recent years, Howard A. Link has made the most thorough study of this subject. The book: Keisei-ehon („Picture book of courtesans“ or „Picture book of castle conquerors“) is also cited with the title: Shōgi-gachō („Picture book of prostitutes“). Five different editions are known altogether. This work must have had a considerable influence on book illustrations of this theme in the years around 1700. ŌMOI Yoshikiyo certainly drew on its example in his Shidare yanagi. OKUMURA Masanobu was inspired as a 15 year old in 1701 to produce his woodblock work Genroku Tayū Awase Kagami („Courtesans of the Genroku Period reflected in facing mirrors“) or his Hokkaki Bigichō. 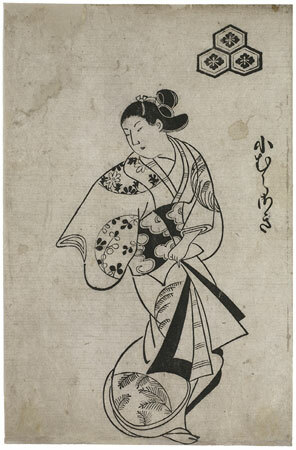 The leaf shown here, leaf one, shows the courtesan Ko-Murasaki („Little Murasaki“) against an empty background. Her personal crest is the four-leaved blossom in tortoise-shell pattern. She grasps her robe as she strides forward. The areas circumscribed with circles are decorated with susuki grass, hagi (bush clover) and other autumn grasses and flowers. These motifs refer to the poetess of the Genji-monogatari, Murasaki Shikibu, the name which the courtesan depicted here adopted, was a famous heroine of the ukiyo world. HISHIKAWA Moronobu devoted a single volume of woodblock prints to her in 1677. Ko-Murasaki and her lover Gompachi appear in a love story of the 17th c. Gompachi, a young samurai, kills a comrade in an argument. Held captive in a house of bandits, where Ko-Murasaki is also held prisoner, he fights against these robbers. He travels to Edo. After a while, he meets Ko-Murasaki again, who has meanwhile sold herself to a brothel in order to pay her parents’ debts. With robbery and murder, he tries to amass the money needed to buy Ko-Murasaki’s freedom. In the end he is captured and put to death. Ko-Murasaki commits suicide on his grave.